How do I position my Razer Nommo for best sound results? The Razer Nommo satellites should be placed equal distance on the left and right with you in the center. Each satellite should be angled to face you directly for optimal sound projection. How do I get the best possible sound settings for my Razer Nommo? The Razer Nommo features independent volume and bass knobs. Adjust the level of each until you get the sound you like. Can I fine tune the EQ settings on my Razer Nommo? 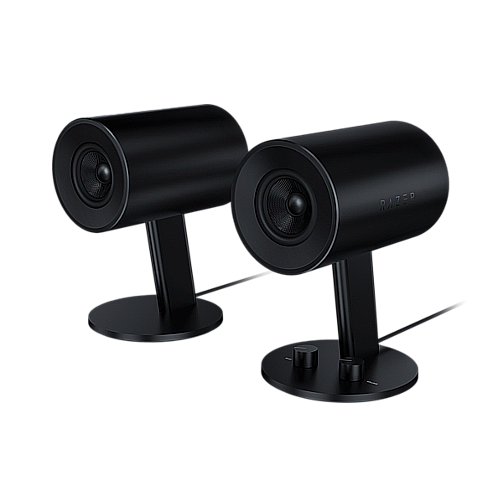 The Razer Nommo has been designed to give you optimal balance of sound without the need for fine tuning your audio. If you desire greater clarity and lower bass, please try to adjust the level of your bass knob to a desirable level. Can I use my Razer Nommo with other devices besides my computer? You can use the Razer Nommo with any devices that have a 3.5mm output jack for audio be it on your computer, TV or mobile phone. How do I know which speaker is "left" or "right"? The base of each speaker has left and right indicators. Can I use the controls on the speaker when my headphones are connected? Yes, you can. You can adjust bass and volume levels on your headphones when connected. Why is the audio output soft? Make sure that the source volume (PC/Mac/Mp3 player/console controller/mobile device) is not low. Be careful to increase volume of source device slowly. Make sure input or aux input is connected to your source device. Also make sure that you do not have any other device plugged into the headphone jack. The audio is not loud enough. We have automatic gain control in our speakers to protect the speakers and your ears. Can I touch the drivers? We recommend against touching the drivers as rough handling may cause damage. What are the warranty terms for the Razer Nommo? You may find out more information on the policies for Razer Nommo here. How do I request or purchase replacement parts for the Razer Nommo? I have a coupon/promotional/gift voucher code for Razer Store. Where can I enter the code so I can use it to purchase products? From your shopping cart page on the Razer Store, please check the box labelled "Enter Promo Code." Enter the code into the box and click "Apply Code." The total price after should reflect the discount. I recently placed an order on the Razer Store and it shows my order is "In Process." When will my order ship? We are sorry if there are any delays in processing your order. The product may be out-of-stock or the order may be under protection/fraud review. Please don't hesitate to check your order status at the Razer Store page by entering your information at the Order Status page. Why does Razer require a "Proof of Purchase"? Razer must verify that the product is within the specified warranty period and that it was purchased from an authorized reseller. Products purchased from unauthorized dealers are often used, counterfeit, re-boxed, defective or gray market goods. These units may also not be designed and packaged to work in your country and may not meet all legal and safety requirements. Razer will not be able to honor a warranty on products purchased from an unauthorized dealer or that are out of the warranty period. A valid proof of purchase is defined as a dated sales receipt from an authorized Razer Reseller. The receipt must show both the product description and price. Invoice slips and e-mail order confirmations can be considered on a case-by-case basis. Unfortunately, our Customer Support team has no information on future product or driver releases. For any information regarding future products, please visit our website or our social media outlets.